SES S.A. (Euronext Paris and Luxembourg Stock Exchange: SESG) has signed a multi-year capacity agreement with SPI International/FILMBOX Channels Group, a global media company that operates more than 30 TV channels, to support the company’s expansion in Latin America and distribute that firm's HD channels in the region. 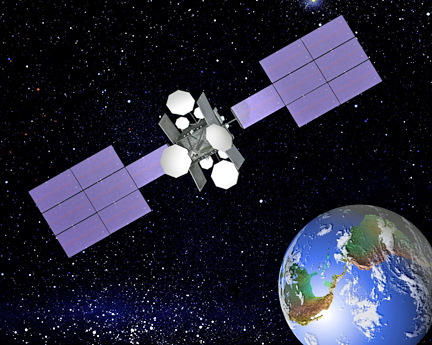 Artistic rendition of the SES NSS-806 satellite. SPI will extend its reach in Latin America thanks to the C-band capacity of NSS-806, which covers the entire region in one single beam and is capable of reaching about 90 percent of all payTV subscribers in South America. SPI will broadcast their premium content to cable operators and DTH providers from the US, bringing up to 10 HD channels to the region: FightBox HD, FashionBox HD, DocuBox HD, Fast&FunBox HD, 360TuneBox HD, FilmBox Art House, Gametoon, NatureVision TV, Erox HD and Eroxxx HD. NSS-806 is located at the prime orbital position 47.5 degrees West and was one of the key satellites to transmit the Olympics Games from Rio de Janeiro to the world last year. The SPI channels are eventually expected to move to SES-14, which is scheduled for launch this year and will replace NSS-806. Jurandir Pitsch, the Vice President of Sales for South Latin America at SES, indicated that SPI will benefit from NSS-806’s high penetration of DTH and cable head-ends in Latin America. This partnership demonstrates that satellite remains the ideal infrastructure to deliver high picture quality content to a large audience, either directly or by feeding cable head-ends.